Monday, while I was visiting the Museum of Modern Art, quite by chance, Tilda Swinton created one of her surprise performances of “Maybe.” I was surprised the next day, when I found I had been captured in the photograph that appeared in the NY Times in an article about the work. Along with my friends Charles, Tizoc and José, another chance-related encounter, (Charles stands to my right with the bright yellow jacket), we were having a typically intense conversation about Swinton’s provocative work. And to continue this extraordinary chain of events, I interviewed MoMA Chief Curator at Large Klaus Biesenbach the following day, who was responsible for organizing Swinton’s performance at the Museum. Believe me, none of this was planned out in advance, except the interview, which is part of an online course on the history of multimedia I am creating for MoMA’s Digital Learning. Much of what I discussed with Klaus Biesenbach was relevant to an understanding of this perplexing and engaging work by the academy award winning actress. The focus of our conversation was Marina Abramowic, whose work Klaus had curated in a retrospective at MoMA in 2009: The Artist is Present. 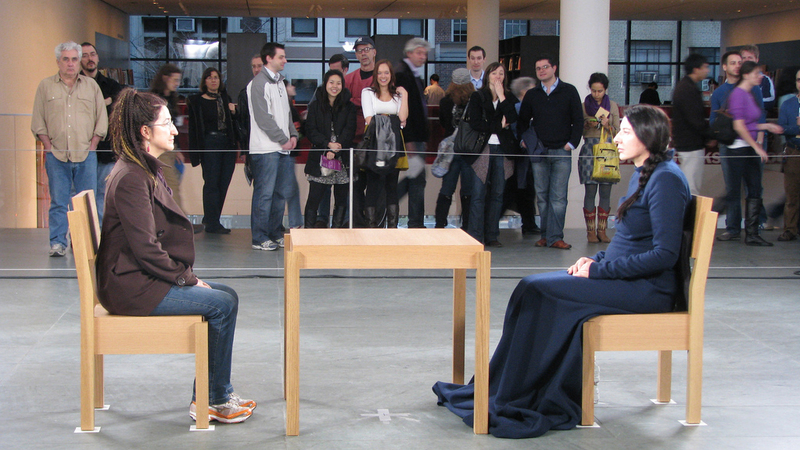 As part of the show, Abramowic had situated herself in the MoMA atrium on a daily basis for three months, seated at a table for an indeterminate duration of time directly across from the viewer. When the artist situates herself into the work, as present in the work, in which the artist is live as an integral element of the work, it changes our relationship to the artist. While Abramovic’s presence involved intense and direct visual contact with the viewer, bringing many to tears in the sheer intimacy of the experience, Tilda Swinton disconnects herself from the viewer through the act of sleeping. And it is very likely the viewer finds her actually asleep, since she stays up the night before in order to exhaust herself as preparation for the performance. 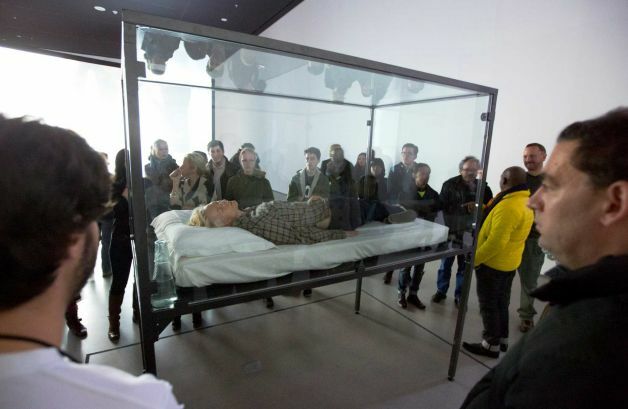 There was something eerily not present about seeing her encased in the glass enclosure, rather more like an object than a physical person, or perhaps even a corpse on display. So perhaps the title of the work, “Maybe,” is suggestive of whether or not we are actually experiencing the live presence of the artist, but this questioning is heightened by Swinton’s celebrity profile. Are we really in the presence of the famous actress? It is not at all certain: she is so removed from our waking reality. It is more likely you will take notice of other viewers around you, alertly pondering the same question. So while Swinton has situated herself into the presence of the viewer, at a closeness you would never ordinarily experience, she appears to be, nonetheless, very, very remote. As remote as a body that no longer breathes. Whether she is actually sleeping or even actually present, or will even be performing on a given day (the schedule is never announced), fills the work with many questions, an indeterminacy that pervades a seemingly straightforward project. The sequence of events that led to my own experience of the work, and the photograph in the New York Times, seemed inextricably tied to the work’s clouded intent.